Amazon updated its free Kindle app for the iPhone, adding three features in version 1.1 that many people—including some right here at Macworld—have been waiting for. The update also adds the ability to pinch to zoom in on images in Kindle books. 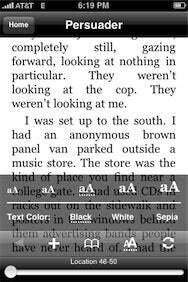 Kindle’s initial release only let you read books in portrait mode. The new version introduces a landscape mode with auto-rotation, so you can read books as they were intended to be enjoyed—widescreen, baby. There is also a small lock icon at the bottom right of the screen that, when activated, locks the Kindle app’s screen orientation either in portrait or landscape for those times when you don’t want the app to automatically reorient itself. The final new feature—and my favorite—lets you tap on either side of the screen to turn pages. Prior to version 1.1, when you wanted to flip a page on the Kindle app, you had to drag your finger across the screen. That method did approximate the feeling of reading a book made of paper, but I kind of thought the whole point of the Kindle was to offer a superior experience to a book. (Or at least, get rid of some of the annoyances lest anyone accuse me of hating printed books).